The Cowin E8 is the newer version of the amazing Cowin E7s. These headphones have been very popular on Amazon for many years now due to being a really good pair of noise-canceling headphones at a really good price. With the Cowin E8s we are being promised an even better pair of headphones at a higher price see current price. It’s time to see if Cowin can deliver on this. One of the things Cowin is emphasizing on this new pair of headphones is the comfort. They have been working on making the earcups much more comfortable than the E7 model. They have actually manage to make the earcups much softer which create a really good fit around the ear. You are also able to wear them for longer periods of time without tiring your ears. In my opinion, the new design is much better. The headphones look better but also provide a much better fit around the head. They fill nice and study with a very nice black and gold finish. Something else that has improved on the new headphones is their sound quality. Cowin has always made headphones that sound great but now they wanted to make something that was considerably louder. This is why they decided to equip the E8 headphones with 40mm stereo drivers. These drivers can produce up to 25% more sound than the E7 which is a big improvement. The low frequencies are still really good. Mids are also well performed which allow you hear very crisp vocals and instruments. The headphones have a very nice punchy bass which is always present. Overall the sound is great considering the price. They are definitely not on par with Bose headphones. The reason you’re probably reading this review is because you’re looking for good pair of noise-canceling headphones. So now let’s take a look at how good the noise canceling is on these headphones. Right off the bat, I noticed the headphones begin to cancel the ambient noise around me when I put them on. These headphones also come with active noise canceling. 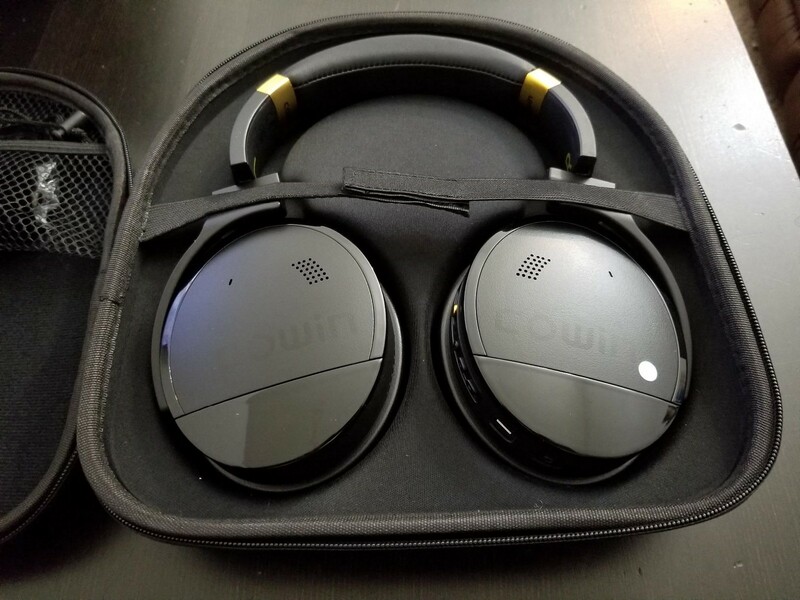 To achieve more noise cancelation Cowin equipped the E8 headphones with 4 noise-canceling microphones that are much better at canceling noise. This makes them perfect for a loud office or a plane. The noise cancelation is definitely one of the best we have seen on a pair of headphones at this price. Some other great features about these headphones are battery life, controls, and a really good microphone. The headphones have a battery life of around 20 hours which held true during our testing. You can find all the controls you need with volume, skip, and multi-purpose controls. The microphone is also really good with people saying that my phone calls sounded really crips. Overall this is a great pair of headphones that sound amazing and do a really good job at canceling ambient noise. Originally published at Sound Patron.